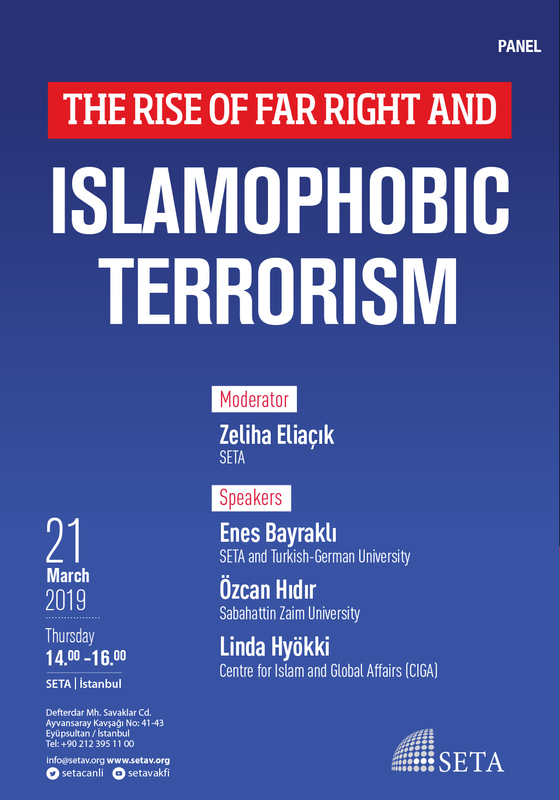 On 21st of March 2019, SETA will organize a panel titled “The Rise of Far Right and Islamophobic Terrorism”. The panel will draw attention to the causes and consequences of the recent Islamophobic terror attacks worldwide, including the attacks in New Zealand, from different dimensions. Related to this, a discussion will be held about what needs to be done in the coming period. Zeliha Eliaçık, Researcher at SETA European Studies, will lead the panel in company of Enes Bayraklı, the Coordinator of SETA Brussels Office and co-editor of the European Islamophobia Report, Özcan Hıdır from Sabahattin Zaim University and Linda Hyökki from the Centre for Islam and Global Affairs (CIGA). We would be honoured to be joined by you at the event. English-Turkish simultaneous translation will be provided.